Philly, this is why you don’t get nice things. The city celebrated its first Super Bowl victory (I mean, congratulations) and gifted us with the image of forlorn New England Patriot Tom Brady sitting on the football field, fresh off of fumbling the damn ball (and we are ever grateful). Both of these things—but especially the last thing—are worthy of celebrating. But then Philly wanted to get real Philly about it. 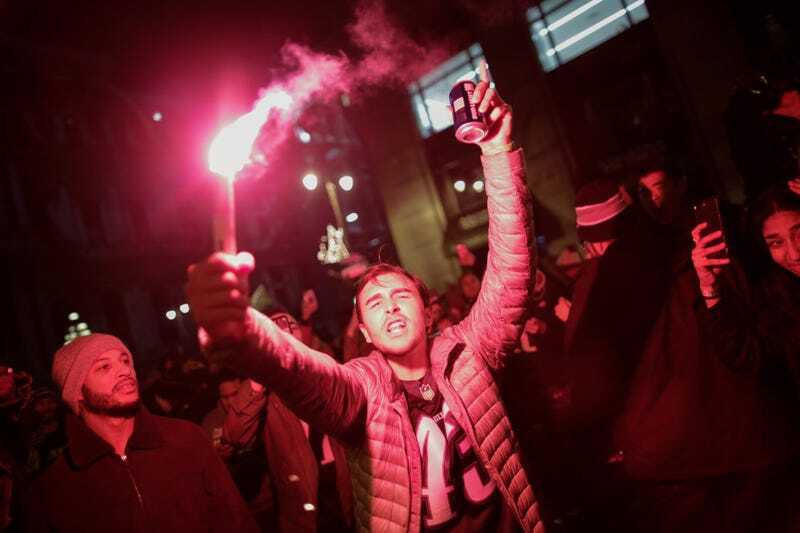 Philadelphia fans demonstrated their right to act a damn fool and celebrated their team’s victory by—how else—damaging property. Rioters Raucous fans flipped cars over, set things on fire and destroyed private property because they were just so. damn. happy. As Newsweek reports, these riots enthusiastic demonstrations included fans climbing on the awning of the Ritz-Carlton on Philadelphia’s South Broad Street, an awning that later collapsed under the weight of all the drunk idiots (because, hello, it’s a damn awning). Philadelphia ABC affiliate WPVI-TV reports that broken traffic lights “were left lying on the street,” a Macy’s store window was smashed and other acts of vandalism were reported. Footage was also taken of fans hurling goods at one another inside a local convenience store, and, in peak Philly outrageousness, one Twitter user, claiming that they were listening to a police scanner, shared that a police horse had been stolen and was being ridden around the city. Lest we forget, black people have been called rioters with much higher stakes and for much, much less. So it’s interesting to note that despite scenes of fans climbing atop emergency vehicles, there is no footage of mass arrests or police in riot gear cracking down on the crowd. Fascinating. As Reuters reports, Philadelphia police and fire officials have yet to release how many people were arrested or injured in Sunday night’s riots, or how much damage was done amid the havoc.